The Help Seeking app facilitates the construction of locally trusted Personal Learning Networks where professionals can seek collaborative support by interacting with their peers by tagging people and learning resources, and exchanging questions and answers around topics of interest. As a worker’s or group’s connections and confidence grow, they then go on to build what we are calling a Shared Learning Network. The Help Seeking app will be connected to a central cloud server, containing existing (and the new ones created by the users) learning resources, contacts, tags. The current app has been designed to support the Healthcare sector, but our plans include to scale its functionalities for other workplace contexts. Mark Smith is a practice nurse working part-time at WestHill practice. He uses the Help Seeking tool in the course of his activities. Mark is interested in obtaining a Diabetes guideline in Braile format for a patient, for this reason he wants to ask to his colleagues about some recommendations: (1) Mark asks a question* by including the corresponding text; (2) annotates the type of problem by adding tags (e.g. ‘Braille’) and also select existing tags from the semantic data base; (3) selects his group of trusted colleagues (using data from his organisational and personal network) to whom the question will be sent. Immediately a semantic analysis of the question and corresponding tags is done using the Learning Layers Social Semantic Server and relevant resources (online guidelines, meeting notes, similar questions & answers and people with recognised expertise in this area) are presented. Mark checks the information and authorship of the resources and adds a new person to his Personal Learning Network as appropriate, adding tags to relate specific knowledge to this person. In time he also receives further responses from her colleagues/network as well. *Note: The system is not aimed at supporting help seeking related to specific patient cases, so no patient identifiable data will be included in these questions. (1) Networking: The system facilitates the transition from a Shared Learning Network to Personal Learning Networks, by creating groups of trusted colleagues. (2) Tagging: The system supports the characterisation of people, data (e.g. guidelines, learning resources) and questions, through tags. Tags can be manually introduced by the user and/or automatically suggested by the system. (3) Scaffolding: The system helps users find the most appropriate helpers or resources. The system highlights those effective question/answers emerged from peers and experts (Community Scaffolding) – realisation of common problems – using workplace conversations and online discussion board. 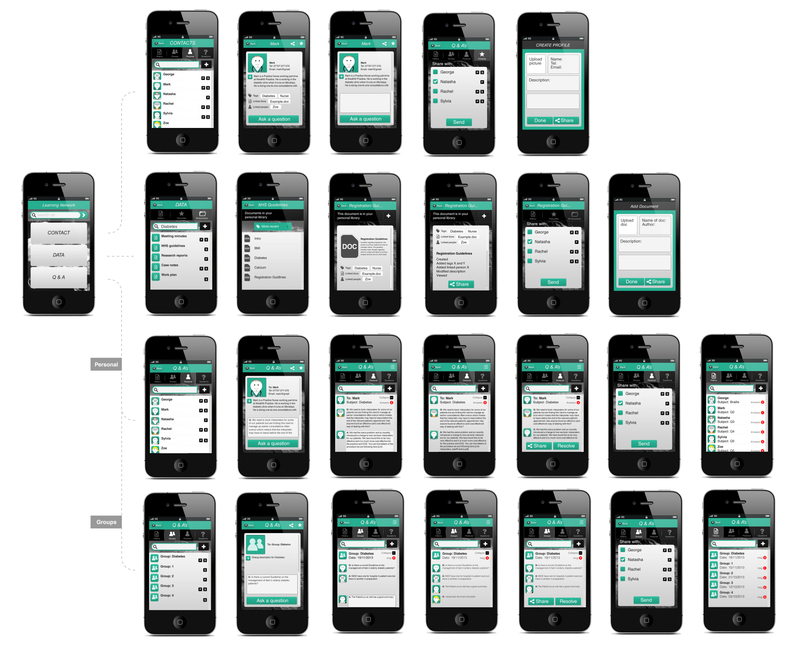 This wireframes have been designed by using Proto.io (http://proto.io/). This figure contains the main sections and functionalities of the Help Seeking appl, illustrating the main functionalities cited above.